Licks 6-29. One of the most important concepts in this module is repeating patterns, which can really spice up your leads. Licks 30-60, which focus on melodic licks that use hammer-ons and pull-offs. Discover subtle musical devices like legato playing, which makes your solos sound effortless. Explore alternate picking patterns, 3 note per string licks, pick-slides… and much, much more. 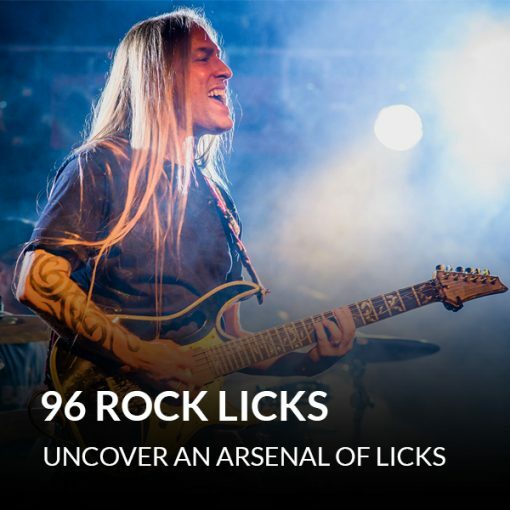 The course 96 Rock Licks will spark your creativity. Steve teaches in a way that allows not only the novice but the well seasoned players to learn things that perhaps were not previously in their wheel house. This course as well as each course GuitarZoom sells will well equip all levels of guitar players with the necessary tools it takes to be a great guitarist. I personally recommend 96 Rock Licks and the rest of the courses! So get your copies today and ROCK ON! Fantastic add on to my courses and relearning my guitar skills. As I found few things I’ve self taught things over yrs that not been great. Since doing it the right way lol. So just taking it all from the start again. Plus I’ve got nice little guitar collection with some nice tube amps. As a lover of the Guitar and music. So on my Army pension I’ve got some time as live alone, ohh and my service dog Trooper who I couldn’t live without him around. So it’s good to start again and even do things I know. As can only get better and maybe start doing some recording of Better stuff and creating my own little CD. As trying to put some words to music as well. I am new at the world of lead guitar playing and decided about a year ago to get down to it and learn. After coming across a few youtube videos of Steve's I managed to learn scales shapes and modes. I was reluctant to purchase any lessons but I was confident in Steve's style of instruction. After purchasing this course I am more than pleased and hyped up to further my guitar skills .Steve breaks everthing down and explains everything so there is no confusion. I think it's a great course and I'm getting a lot out of it, my only complaint is it seems in some of the guitar demonstrations Steve, seems to be moving too fast for the student to fully grasp the concept. Exp. in the blue scale where he's demonstrating the blue note, I had to replay several times to realize what strings he was actually playing. I thought he was demonstrating the blue note, turns out he was just playing the pentatonic scale without the blue note. This confused me until I finally realized what he was doing, and that's because he played the demo too fast, and without the blue note, when the demo I believes was to show how the blue note was to be used. I've only gone through the first five licks. So far I'm quite happy with the course, just feel there was unnecessary confusion created because of the speed in which he was trying to get through the material. Steve's a great teacher, and I love his courses ... at times it's just hard to follow when he's time crunching, and I say this as intermediate mediocre player. Very good course! I am just coming out of a 10 year guitar hiatus. I was able to get back to the skill level I was at before I quit playing in a few months... but soon became stagnant. I was in a rut, and this course is teaching me new things to get out of it! Thanks Steve! You are a great teacher! Great course. I am beginer and this course is great for me. Great Course. I only have one compliant, and it has to do with technological. A couple of the licks won't play. It happens on my work computer, my home computer and my phone. Would love to get this worked out if you can help with this. I love the Course though, very awesome!! I looked into this course after I saw an ad on Facebook. I reluctantly played it and found that I liked the way Steve taught, his personality and candor. His method of teaching was slow, and systematic. I have been playing for a long time and I know a bit of theory. I became stuck in my playing after many years and was looking into courses. I ordered the course along with a few others. I am still early into it but I have learned licks that I always wanted to do but never really figured out. It's a pleasure to have Steve on my TV in my home with my gear and learn. I would HIGHLY recommend these course for beginner and intermediate alike. I am looking forward to the rest of my schooling and know that I am being taught by competent and well-rounded teacher. Steve plays great, teaches great and is a likable guy. It's a pleasure to work my way everyday to become a more versatile and grounded guitarist. Thank you, Steve! Love the course! So many great licks to learn. Steve is an incredible teacher and even more incredible player. I'm totally enjoying it and will be buying more of his courses. Between Steve and Griff Hamlin, I'm the best I've ever been...at 62!! Fantastic, easy to understand course. I have had vast improvement in my playing. I almost sound like I know what I am doing HA HA. In all honesty, this is a wonderful way to learn lead licks and the combinations are almost endless and best of all, they sound great in any key. I have a better understanding of my fret board and I am forever grateful. Thank You Steve! Very useful course, if one knows how to deal with it and dig a little bit more there is lot of fun for several months of good practice and creative soloing. Great course, Steve has created many "Lightbulb" moments for me. He's a great teacher! Thanks guys! 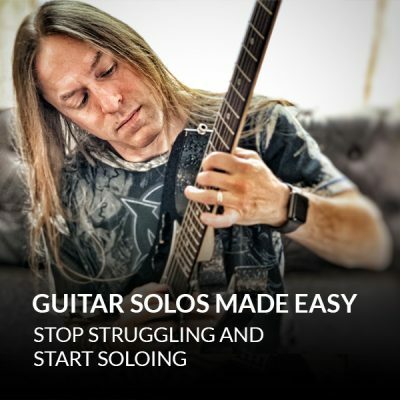 Have never played solo as I dreaded the difficulty, but after doing this course, Steve makes the licks easy to follow and I am sure with more practice I will be able to achieve my goal. This is a well structured course and like all Steve's courses very well presented. Nice review of how to embellish your phrases at the beginning of the course. Then, a good variety of licks for use in the blues rock, metal genres. It's a course you'll go back to time and again for fresh ideas. This is one my favorite courses of Steve's. The licks have opened new possibilities for soloing and creating my own solos. Steve is the best the best instructor. The way he breaks down everything is easy to understand stand and then apply it to your playing. I owe the confidence in my playing to Steve. Thank you. This is an awesome course. Steve is the best at teaching on a level that is easy to understand. I've been playing for many years and I have to say that since I've discovered Guitarzoom, my playing within the last year has improved 100%. I now know what the heck I'm doing!!!!! There are a number of different licks to learn and play with. The only drawback is I have no really good sense of what lick will work with what music. It would be nice to see some examples of real songs as a backing track with the licks thrown in as illustrations as to what sounds good and what doesn't. As it is now, I feel like I'm being given a bunch of tools with instructions as to how to turn them on and off, but nothing regarding how you use them in real life. The Minor Pentatonic and Blues scales are awesome in the 96 rock licks. It opens up a new chapter in my fretboard understanding and playing. As for the licks I am still learning. This is one of those courses, when i have only 15 minutes, I can study a lick, absorb it, and practice it over the next week until it starts becoming engrained. I keep coming back to this course to grab a new lick about once per week. This approach works out great on top of all the other stuff I'm studying, playing, writing, jamming, and band practice. Love the course! I have only practiced up through lick 21 so far because I'm really trying to make playing them second nature. I'm already feeling far more comfortable in running licks together and I absolutely love this course. Sometimes Steve will play the lick and then join that lick in with several others, but at quite a fast speed. My only suggestion would be for Steve to show us how he joins the licks because it's hard to follow when played fast. Other than that....this is outstanding!!! Out of all the courses I've bought of Steve's I use this one on a daily basis and is a great practice lesson. Some of the licks force me to stretch.while others simply keep me sharp. I look forward to another course like this pile on the licks. This was one of the first courses I bought to get me started again after being away from my guitar for many years. 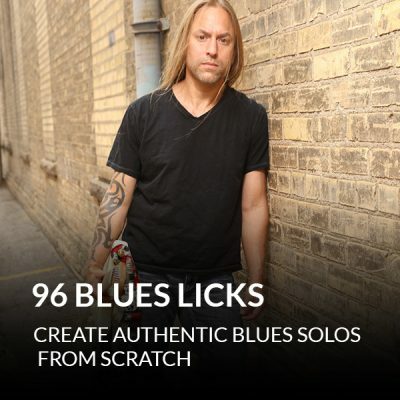 A great course to help you start to build a very complete licks toolbox! Steve takes the time to show you them all and also provides the tabs. Great trick. You think you are learning licks but suddenly find out you have learned a lot of techniques. Damn, I didn't know that I was practicing and really hate practicing technique. Great,straight to the point licks. Nothing fancy or useless here. Just useful guitar licks ready to incorporate in my solos. I will come back soon for other licks and lessons. I love this course, I dip in and out of it at will. I find that you can dive in anywhere and find something great to learn practice, I then try and add what I am learning into my own solos somewhere. 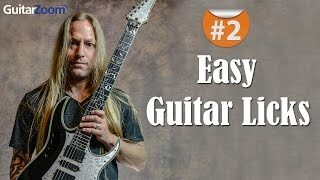 As somebody else mentioned, that is the hardest part of it all, perhaps a few tips on linking the riffs in with each other or with general scale riffing. I am pleased that I purchased "96 Rock Licks" and will, doubtless, be looking at it for the rest of my playing life. Thank you. Hi Dan/Steve just wanted to say how impressed I am with this course I have been using it along side another course so have been gradually getting through it.Although I have been playing for a fair few years this course has opened up new ideas when I'm soloing along with improving my technique and fluidity.Over the years I have invested in many courses from the UK and abroad but hand on heart Steve is in my humble opinion streaks ahead of any competition as a tutor especially in the way he presents every lesson his enthusiasm and passion for what he does oozes out of the screen and is very infectious that I end up staying on the guitar a lot longer than intended. If I won the lotto my winnings would dwindle very quickly as most of it would end up buying stacks more courses from yourselves but at this present time I have to seriously discipline myself when it comes to your emails so far i have coped reasonably well and the ones I have succumb to have all been worth the outlay. Once again thanks and keep up the stella work!! I am a beginner looking to expand my musical vocalbury. Licks are a cornerstone to my vocalbury so to get a course with 96 licks is awesome. 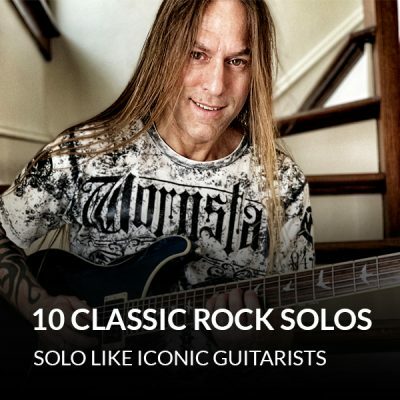 Each lick is explained in detail by Steve Stine so it really is a valuable course in order to grow as a guitarist. Love all the licks. i do wish Steve would have shown a little bit more of how to string some of these licks together to make a solo, however. But the licks are great. An excellent way to increase your lick reportoir. This is a great course for all skill levels as there is something for everyone. Perfect for beginners and as well as advanced guitarist looking to spice up their guitar solos.